THE comedian and champion of declining architectural gems Griff Rhys Jones has put his weight behind a campaign to bring a lido back from the brink of disrepair. The presenter of the hit series Restoration yesterday visited the decrepit Broomhill Pool in Ipswich, which was shut in 2003. A campaign to restore the 1938 Grade II-listed building, which was one of Ipswich's best-loved leisure facilities, has stalled. In the meantime the structure has crumbled, the water has filled with algae and the once bustling stalls are overrun by weeds. Ipswich Borough Council's last ruling group had looked at submitting a bid to the Heritage Lottery Fund, which required time and money to put together. But the plans were suspended when the new Conservative/Liberal Democrat administration came into power so it could review its spending priorities. Between £1.5million and £3million is needed for the venue's repair so it can be used as an outdoor Olympic-sized pool to rival the town's Crown Pools. The Broomhill Pool Trust believes at least £67,000 is needed for surveys, including an in-depth analysis of the structure, which is leaking and subsiding. Calling the venue "very attractive" and describing the idea to turn it into an ice rink during the winter as "fantastic", Griff leant his support and advice. He said: "I hope the council looks seriously at the issues. During a squeeze there's always a need to try to work out what the priorities are. I hope people don't think swimming facilities are a loss just because they have got a new pool." "I am surprised by how many pools I have seen in Essex that have closed down. I think it's much better that people go swimming rather than spending a huge amount of money on posters saying eat less mayonnaise." He added: "They are closing down swimming pools across the country but how much are they going to spend to stop children getting fat." Griff has extensive knowledge of fundraising both through the BBC programme and through his own project to bring back the Hackney Empire. He warned the trust of the enormity of the task. Competition for money was fierce and investors would also want assurances that their money would not be wasted, with proof the pool could be run without further help. Griff said the trust would need a dedicated group to target funding and also urged them to seek campaign sponsorship from companies connected with swimming, like Speedo. The first step would be raising money for surveys to find out how much is needed, how it needs to be spent and what options are available. But he also urged them to do research of a different kind, like buying Suffolk author Roger Deakin's book Waterlog: a swimmer's journey. He said: "You have to turn it into a voting issue. In order to turn it into a voting issue you need to make someone somewhere in the council think 'if we do not do something about the pool and the heritage of Ipswich then people will vote us out'." Mike Read, record-holder for swimming across the channel and trust member, said: "It's a tragedy to have allowed this beautiful pool to get into this state. I think it was a flagship. Where else is there a 50m outdoor pool? The answer is you have got to travel 60 miles to find an open air one." 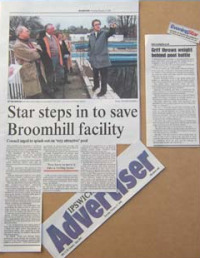 Dale Jackson, leader of the council, said: "It can't be saved just as a pool. It would have to be a development with bars and a café: a leisure facility not just a swimming pool. We would also be looking at some residential. We want it open and re-used, I canvassed for 20 years for this pool." Copyright © 2005 Archant Regional. All rights reserved.